It's far from a clear picture ahead of Round 7, with much still to play for in terms of promotion and relegation and who will contest the Division 1 final. Indeed what muddies the waters more even is the fact that the Round 6 fixture in Division 3 involving Louth and Westmeath has still to be played. It fell foul of the weather last weekend. More on that later. What is clear, however, are the standings in Division 4, with Derry and Leitrim sealing their promotion after Round 5. Kerry lead the way on 10 points and are virtually guaranteed a place in the final. Galway and Mayo, both on 8 points and Tyrone on 7 points are also in the mix to contest the divisional decider on 31 March. So, a point for the Kingdom away to Roscommon will see them head the table. Even if Peter Keane's side were to come away empty handed against the Rossies and Galway and Mayo were both to win, their superior scoring difference should still see them finish in the top 2. As things stand, Kerry are +11, with Mayo +7 and Galway 0. So, if a three-way tie at the top of table comes to pass at 3.40 on Sunday, the Tribesmen, whose scoring difference is currently inferior, would lose out on a final berth. Now, if both Galway and Mayo finish on the same number of points, then it's the Green and Red who would make way on the head-to-head rule. James Horan's men lost to their neighbours on 2 March. Mickey Harte's Tyrone are arguably the form side in the top tier at the moment, but must beat Galway and hope that Mayo lose to Monaghan to see another day out in the competition. Cavan prop up the table on two points. There is a slim chance, very slim at that, of the Breffni men avoiding relegation. They will have to beat Dublin, hope that Roscommon and Kerry draw, Monaghan lose to Mayo - and then start praying that their scoring difference is enough to see them finish above the bottom two. 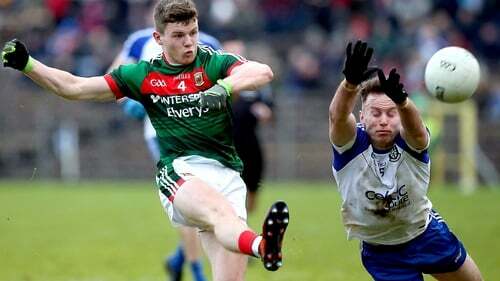 Monaghan, currently on four points, will stay up if they win away to Mayo. Roscommon, who have three points, know that a draw would keep them in the section if the Farney were to lose in Castlebar. Both teams would then finish on four points, but the Connacht side would maintain their status on the head-to-head rule after edging out Malachy O'Rourke's men on 3 February. A final scenario of Monaghan drawing and Roscommon winning would also see the latter safe on the head-to-head. Meath, Donegal, Fermanagh and Kildare are all in mix to achieve top-tier status for 2020. As things stand, Meath (10 points) could afford to lose against Fermanagh and still go up. That outcome would leave the Ernesiders on 10 points and if Donegal were to take both points on offer when they host Kildare. then they would also be on a similar tally. A three-way tie would result at the summit, but the Royals' scoring difference, currently +20, should be good enough to see them top the section. In any event, a draw would be enough for Meath to gain promotion to Division 1 for the first time since 2006. A win for either Donegal or Kildare will see them step up if Meath defeat Fermanagh. The latter, however, could make the jump if they finish level against Meath and the Lilies win in Ballyshannon. That would leave both on nine points, but Rory Gallagher's men in front on the head-to-head standings after a narrow victory when the sides met on 9 February. Of course, another two points for Fermanagh and any Donegal slip up would also see a positive outcome for the former. At the bottom, it's very much a reflection of where Munster football is at at the moment as two from Clare, Tipp and Cork will make the drop. Clare (3 points) will survive if they beat Tipperary (3 points). A draw will also keep the Banner safe if Cork (3 points) lose away to Armagh - superior points difference to Tipp. A win for Tipperary would be in vain if Cork prevail at the Athletic Grounds. That would leave the pair on five points, with the Rebels surviving on the head-to-head after they beat the Premier on 2 March. It goes without saying that Liam Kearns' side will be hoping that Armagh take care of business if they themselves are victorious at Semple Stadium. Now this is where things get a little complicated following the postponement of the Louth-Westmeath game last weekend. Down lead the way on 10 points and if they avoid defeat at home to Louth (6 points), then they will be promoted. Simple as that. Laois (8 points) can seal their promotion ticket if they beat Carlow and Westmeath (7 points) lose to Longford (7 points). The Louth-Westmeath result would then be irrelevant. However, we would be dragged into an April finish if Westmeath or Louth were to win their remaining two games, with one or the other then being promoted. Longford are still in the mix for promotion, but they must beat Westmeath, while also hoping that Carlow defeat Laois and Louth get the better of Westmeath, for that to happen. Down at the bottom, Sligo (0 points) are already relegated. Joining them will be either Carlow (5 points) or Offaly (3 points). A win for the Faithful, coupled with a loss for the Barrowsiders, will see John Maughan's outfit survive on the head-to-head rule. Derry and Leitrim can't be caught at the top and both can look forward to a Croke Park engagement next weekend. Live blog on RTÉ.ie and the RTÉ News Now App from 1pm on Sunday. Live commentaries and updates on Sunday Sport, RTÉ Radio 1, from 2pm. Highlights of all the weekend's action on Allianz League Sunday on RTÉ2 and the RTÉ Player from 9.30pm. Saturday: Dry in most areas with sunny spells. However, there'll be a few showers in parts of Connacht and Ulster. Highest temperatures of 7 to 10 degrees with moderate west to northwest breezes. Sunday: Staying mainly dry with good sunny spells over the southern half of the country. It will be cloudier further north with showery rain developing in northern parts of Ulster and Connacht. Highest temperatures of 7 to 10 degrees with moderate westerly breezes. For more go to met.ie.